The FP, introduced to the market in 1963, is Konica's first SLR camera with the Copal Square shutter. 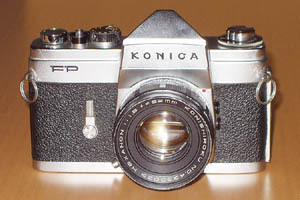 The earlier models F, FS, and FSW all still had Konica's own Hi-Synchro shutter. 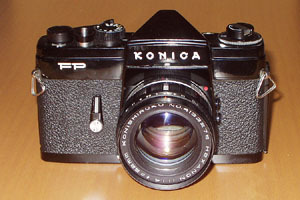 In addition, the FP was the first Konica SLR to sport a central microprism spot on the mat screen as a focusing aid. 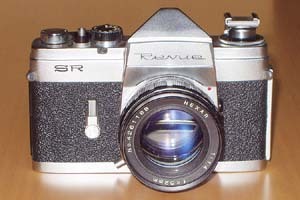 In Germany, the FP was distributed by Foto-Quelle under their own brand as Revue SR. In the USA, it was likewise available as Wards slr700. The standard lenses that were sold together with the Revue versions, all bear the designation Hexar without a manufacturer's name instead of the normal designation Konishiroku Hexanon. However, they were also built by Konica and are the same lenses as the respective Hexanons sold elsewhere. The Konica FP is an exclusively mechanical camera for manual setting. It has no built-in light meter and therefore does not need any batteries. Like with all mechanical cameras without light meter, the operating controls are quite basic. Beside some features that already where quite common at the time, like single-stroke transport lever, rewind crank, or instant-return mirror, the FP has a self-timer which also provides mirror lock-up functionality. When tripping the shutter release, the mirror flips up and the lens's aperture is being closed, so that the vibrations caused by the mirror have time to settle until the shutter opens after the self-timer delay. In addition, there are a stop-down button for depth-of-field preview in the viewfinder, M- and X-synch flash sockets, a self-resetting film counter and a film-type reminder dial below the rewind crank. The lens mount of the FP is the older F bayonet with a 40 mm diameter, without coupling for the aperture value set on the lens. The newer and much more readily available Konica lenses for the AR bayonet cannot be used on this camera. Given the use of matching lenses, the Konica FP has an automatic aperture mechanism – when the shutter is tripped, the lens is automatically stopped down by the camera body to the value that has previously been set manually on the lens. This was nothing new at the time, but it was not yet something to be taken for granted. The viewfinder of the FP is relatively bright and clear. The mat screen is equipped with a central microprism spot as a focusing aid. Apart from the mat screen image, there are no informations available in the viewfinder. Shutter speed range is from 1 s to 1/1000 s and B. The flash synch for electronic strobes was quite fast for the time with a shortest 1/125 s.
The position of the accessory shoe, that was available as a separate accessory, is a bit strange. It rests above the rewind crank and has to be removed from its seat for rewinding the film. It simply plugs into a matching guide on the camera body and has no flash contact. The flash bulbs or strobes have to be connected with a cable to the matching PC socket on the camera body. From today's point of view, the Konica FP is not first choice for a user camera, it's more a collector's item, even though the cameras are not particularly expensive. The main problem is, that lenses and accessories for the Konica bodies with the older F bayonet are rare and not easy to get. From Konica, there are no wide angle lenses available at all with focal lengths shorter than 35 mm for the F bayonet. The old Konica bodies and lenses are also of very high build quality and very rugged – but the operating controls on the FP are in general not as smooth and a pleasure to use as with the later cameras of the Autoreflex series. External Cadmium sulfide (CdS) light meters are available as a separate assessory. They can be mounted on the camera and are coupled with the shutter speed dial by a small groove. There are two different light meters matching the Konica FP. The older Konica Light Meter is sitting on the prism housing and clamped to the viewfinder's eyepiece, the newer and much smaller Konica Light Meter II is mounted with a clamp around the shutter speed dial base.